Want To Start Your Own Successful Affiliate Website? III. Affiliate Marketing – Trend or Here to Stay? If a friend were to ask me what my favorite thing is about affiliate marketing, my answer would be simple, “it’s allowed me to work from home”. No boss, no set schedule, and the freedom to spend each day doing, well, whatever the hell I like while still bringing in an income. But I didn’t open up my computer to a successful, money-making affiliate site. It took months and months of learning, applying, and even purchasing different courses to get where I am at. Sure you can, and this free guide was put together to not only share the skills and knowledge gained throughout the years, but to help you confidently create your own profitable affiliate website. Wikipedia defines it as is “a type of performance-based marketing in which a business rewards one or more affiliates for each visitor or customer brought by the affiliate’s own marketing efforts”. For a moment, I want you to throw out all the definitions or complex thoughts that you may have when it comes to affiliate marketing. Our definition is much simpler. Affiliate marketing is a way for bloggers/websites to make money. If someone clicks your ‘special’ affiliate link and decides to make a purchase, you earn commissions. At which point, your work is done. Of course, there are other ways to earn with your affiliate link (you can share it on social media or send it in an email), but the most effective and common way is through a website usually on someone’s blog. Real quick, before getting into strategies and details of how one earns through affiliate marketing, I’d like to share why I think it’s an awesome business model and ideal for beginners. Listed below are some benefits we believe make affiliate marketing a great option for any beginner looking to make money online. As an affiliate, you can recommend products that you yourself use and earn commissions as a result. Though it’s not a requirement to actually own the products you recommend, it’s best to promote products and services that you believe in or have helped you personally. If you can offer solutions to people’s problems, help them make a more informed decision based on their needs, you can make a lot of money in this business. Byrdie.com is a website which focuses on beauty, makeup and wellness tips. On one particular article, they offer advice and a solution to help people with excessive dandruff. The solution, 10 of the best shampoos for dandruff. They list 10 different brands of shampoo while giving a description for each and how it can help with dandruff. If someone visiting the website decides to click on one of these shampoos, they are taken to the Amazon website where they can finalize the purchase. At which point Byrdie.com earns a commission. Each time this happens. They don’t need to ship the item or do anything related to customer service. Their work is done. They are offering a solution which can benefit the reader which is a win-win for both parties. The customer gets a great product, and the affiliate gets paid for recommending the product. This is just a brief example, but I’m sure you have a better understanding of how the whole process works. We’ll show some more great examples from affiliate sites earning top dollar shortly. Another benefit is the low startup costs. To this day, I spend $100 per month to operate my affiliate websites. When I got started over 3 years ago, I spent half of that using the training we share below. Could I spend more on advertising and other business-related costs? Sure. But I choose to stick to what has been working and earn way in return month after month. Compared to starting your traditional brick and mortar store, where you can have several expenses including commercial property, inventory, marketing, employees, insurance and licenses, and more. You’re looking at investing thousands and thousands of dollars before earning your first cent. Starting an online business is dirt cheap in comparison and can produce heaps of profit when done correctly. 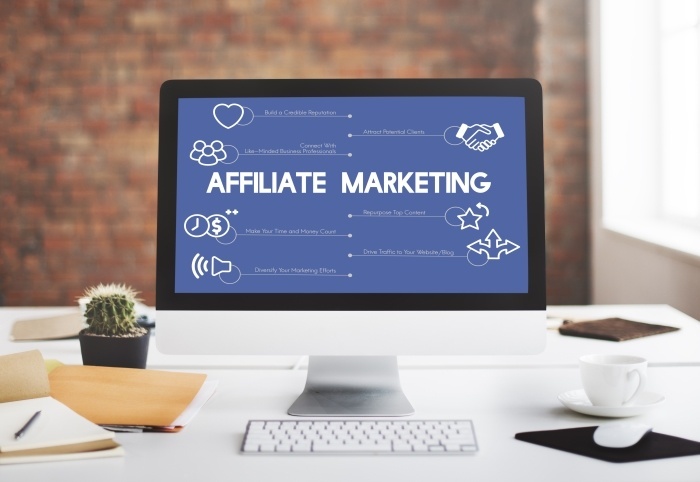 In our post, Is Affiliate Marketing For Beginners, I share my personal experiences and even go into a bit of detail as to why I feel affiliate marketing is a great place for beginners to start. As an affiliate, you ultimately rely on other business to deliver a great product and to stay in operations. If a company decides to make changes or close their affiliate program for any reason, you are at the mercy. The obvious solution would be to just go off and find another affiliate program offering the same or similar products. And of course, creating your own is always an option too. The good news is that affiliate programs have only been improving. Companies are doing their best to attract more affiliates by making it easier to track affiliate data, offering better commission rates, and more. I think it’s safe to say that affiliate marketing will be around for some time. 3. Affiliate Marketing – Is It Here To Stay? A concern I had early on was the longevity of this business. Is affiliate marketing here to stay? Can I make a career out of this? Will it die down eventually? Like me, you probably have or will have concerns. I can reassure you, affiliate marketing has been around for a long time, and it’s not going anywhere. In fact, it will only continue to grow in the years to come. Sor Source: Statista – Affiliate Marketing Spend In The U.S. The amount of affiliate marketing related purchases is expected to grow near 7Bn. by the year 2020, that is within the U.S. alone. (People from all the world can and are running affiliate business with location, background, age, gender, education, etc, varying). This just creates more opportunity for pretty much anyone interested in becoming an affiliate or interested in earning income online. Affiliate programs are constantly updating their platforms to capture the interest of new “partners” or affiliates. Likewise, they seem to be making it easier for affiliates to promote their products. They are a bonus for companies and merchants. This is because of the “pay for performance” model. Affiliates don’t earn any money until the sale is made. Companies and merchants don’t have to pay the affiliate unless results, such as a sale, are performed. The cost of paying several affiliates a certain percentage per sale can be much more cost-efficient than hiring an ad executive and marketing team for $100,000’s (if not millions) in hope of results. Bottom line, it’s here to stay and the opportunity for every day, average people like you and I to make money online is increasing. We know what affiliate marketing is, we know who it’s best suited for, we also know that according to some sources, it’s a growing industry. What we didn’t cover is how it all works exactly, what’s the process of getting started? As you can see from the chart, earning is a matter of attracting the right audience to your website, and then connecting them with products or services they were already looking for. If you shop regularly online, chances are you’ve made several purchases through an affiliate site, perhaps without even knowing it. The last online purchase I made personally was a couple weeks back while in the market for a new laptop. After doing a bit of looking around I came across this website recommending chrome books and said that they were great for home and business use. Though I was looking for a laptop and didn’t know the first thing about chromebooks, I ended up with a new Asus Chromebook based on someone else’s recommendation. I got a product (that I love so far) and even spent less money than anticipated. Since I went through an affiliate site before purchasing, they earned a commission. Do you think I landed on that website by coincidence? Or that this particular website knew exactly what it was doing by attracting the right audience, posting relevant content, and addressing a problem and offering a solution or helping people make a more informed decision. I think we both know it was no coincidence. And when you can attract more people to your website, this creates more opportunity for people to click on your affiliate links, meaning more revenue for you. After a few more awesome examples of affiliate marketing in action, we’re going to show you where you can begin creating your own niche affiliate site today. Some websites we’re going to share are “bigger” with several employees, writers, editors, the whole nine. While some are smaller but still great examples of affiliate sites. Most importantly, it will give you a chance to view websites in niches that are making money today. First up is the Wirecutter and it’s one of those “bigger” sites I was talking about. The company was founded by Brian Liam but eventually bought out by the New York Times for $30 million. (Could you imagine? Remember each person and each website has to start somewhere). The wirecutter earns revenue through several affiliate programs including Amazon and Best Buy. The website offers various reviews of gear and gadgets that they themselves try and test before publishing a review and have really built up credibility and trusting followers over the years. Car Seat Answers offers advice and tips for car seat safety. This makes a great evergreen niche as car seats will always be in demand and parents want to ensure their children are safe while traveling. The site earns through affiliate programs such as Safety1st, Graco, Britax, and other car seat brands. Herepup is a huge website all about dogs. They earn their affiliate revenue through the promotion of dog insurance, training programs, toys, pet food, and lots more. (Pro tip: though herepup is a great example of a successful affiliate site, “dogs” is a huge niche to cover. Especially for anyone just starting out. Some related niche ideas would include “natural dog food”, “dog health”, “organic dog treats”, “best dog toys”, even “cat tree houses”. NerdWallet has grown from a simple credit card comparison blog into a large personal finance website with topics ranging from student loans to investing in stocks. It makes all of its money through partnerships with different financial services companies as an affiliate and most of its content serves as comparisons and reviews. Muscle For Life shares their expertise in the health and fitness industry covering topics like losing fat, building muscle, supplements, and more. The website earns its affiliate revenue by promoting items of these very topics. Football Snack Helmets is a website about, well snack helmets. This is more targeted towards football fans who collect team memorabilia rather than someone looking for just a bowl. The website earns strictly from Amazon’s affiliate program. What’s one thing you noticed about the different affiliate websites we decided to share? …There each in different niches! This just goes to show that regardless of what you’re in to or what niche you choose, their’s opportunity to make money online. Of course, some of these examples have a huge staff and paid employees at their disposal, resources you likely don’t have when just starting out. But keep in mind, each of these affiliate sites was “blank” website at one point in time too. And here’s our #1 recommendation for creating a successful, long-term, affiliate marketing website. To learn affiliate marketing or even continue growing as an affiliate marketer, our favorite platform would have to be Wealthy Affiliate. The platform consists of training, a website builder, researching tools, a community of experienced marketers, personal and technical support, and more, all in one place. Best of all, you can get started for free and try it all out for yourself with a free Starter account. If you enjoy Wealthy Affiliate, upgrade to Premium to unlock all the training and benefits. If not, you can part ways without having spent a thing. Let’s have a quick look at some of what Wealthy Affiliate has to offer. Wealthy Affiliate has 2 different courses. The “main” course, the Online Entreprenuer Certification Course focuses on promoting a niche of your own and has 6 modules. These modules take you from A to Z and can turn any novice into a seasoned, knowledgeable affiliate marketer. From building the physical website to adding your own affiliate links, to creating a presence on social media with your business, to learning how to create content that turns readers into buyers, WA walks you through it step by step in their Online Certification Course. The Bootcamp is geared towards helping WA members learn how to promote their system. How many people do you know who may be interested in a place that could help them earn more money? Wealthy Affiliate can be great for them to begin learning. The Bootcamp has 7 modules and each year WA hosts their four-day “Super Affiliate Conference” in Las Vegas, NV. This conference is completely paid for by the owners and includes food, flight, room, and entertainment. All of their top affiliates get together, along with the owners, to discuss future updates to the platform and also a chance to give feedback on areas which could be improved. Kyle, Myself, and Carson. The founders/owners of Wealthy Affiliate. Another thing WA offers is weekly webinars for its Premium members. As a premium member, you get access to all the past and upcoming webinars which are hosted every Friday at 5pm PST. The topics of the webinar range in topics and though are usually beginner-friendly, they do cover some advanced topics from time to time as well. For instance, the entire Football Snack Helmet website (one of our affiliate site examples above) was recorded live over a 4-week period for members to see in the webinars. We got to see Jay, who hosts the webinars, put together the entire thing. From an idea to earning income with the site. It’s their for all members to view. Each time I watch a webinar, I learn something new and it’s a great resource for all members. Here is where you can build your website in 4 simple steps, within seconds. SiteSpeed – WA websites run fast! Website hosting is included with each membership along with the ability to host p to 25 of your own websites. These aren’t just little ‘add-ons’ but quality resources and tools put in to place to help make the lives of online business owners a bit easier. Through Live Chat, you can get immediate help from other, experienced members. SiteSupport is for any technical issues regarding your website or Wealthy Affiliate account. You also have your own profile page so that you can network with people – from new members to members who have been a part of the community for 10+ years, including the owners. WA includes everything you need to succeed, all in one place. But still, their are lots of work involved if you wish to succeed as an affiliate marketer. (If you decide to join Wealthy Affiliate through Extra Paycheck Online, you will get my personal help and gidance along the way. I’ve helped many go from no idea to earning a regular income from home. Let’s work together. Join WA here and I’ll see you on the inside! As with any business, succeeding with an online business is about having the right mindset and setting time aside to work on your business. Rather if you’re learning, researching your niche, or creating helpful content, try to commit some time each day. If you need a break, take one. Vacation with the family? Not a problem. But come back to it! We break down having the right mindset to succeed as an affiliate and even share what NOT to do in our post, Can You Make Money With Affiliate Marketing – It Depends! Ultimately, it comes down to following quality training and focusing on how you can help your website visitors as opposed to viewing everything as a money sign. This kind of thinking provides the best reslts. Now, will your affiliate website take off overnight making you an instant success? Let’s be realistic: probably not. But can you slowly build your way up to become an authoritative website and eventually change your life with a single affiliate marketing website? Absolutely. Patience and persistence is the name of the game. At the end of the day, you have the freedom and flexibility to choose your own business direction (niche), choose which topics you want to write about, and connect with people in your own unique way. If you can address problems, concerns, or interests of the people who are visiting your website in a helpful way, you can succeed at affiliate marketing. Affiliate marketing is simply a way for bloggers and websites to make money. While there are other options for earning money from home and other legitimate online business models, affiliate marketing is one of the most lucrative, beginner-friendly options avilable. Not to mention, you can make a considerable amount of money as an affiliate marketer and all it takes is one website. Use the tips found throughout our top affiliate marketing guide and consider joining the training we share to learn how to build a solid foundation for not only you affiliate business but yourself. How would earning extra side money or even replacing your current income while working from home benfit you? Let us know in the comments below! I absolutely loved your article on the top affiliate marketing guide for people just getting started. I’ve read more than a few articles about affiliate marketing and I can easily say yours was the clearest and most comprehensive I’ve ever read. Awesome. I am a huge fan of WA as well. I found it about a year ago after doing some research on affiliate marketing. I was fortunate not to go down too many rabbit holes before I found WA. I am curious. I know you’ve been doing this several years now. It does take consistent effort. How long did it take you to begin seeing a steady stream of income each month? Even if it was $50. To answer your question, it took about 6 months before seeing a consistent income with affiliate marketing. It kind of snowballed from a couple hundred dollars a month, to a couple thousand, and so on in the months that followed. These kind of results are typical for people who are willing to see it through as earning money is not an instant thing. What I strongly encourage people to do, as hard as it can be, is to forget about the money when just getting started. Earning from your affiliate business, or any business for that matter, is a byproduct of helpful content and offering beneficial solutions, products, or services. We try to make this a point in our Top Affiliate Marketing Guide above. I have been researching a lot about affiliate marketing, being new to the space. Your article was very clear and straightforward, describing the process to get started. I really appreciated the examples of different sites – I didn’t know that some of them were affiliate marketing sites! Thanks for such a comprehensive article. Glad that you enjoyed our Top Affiliate Marketing guide. We felt it was important to share a few affiliate marketing website examples so that people can get a live view of sites that are actually earning as affiliates. While some of the sites may seem very complicated to do or hard to compete against, some people may be thinking “I can never build something like that” or “looks complicated”, I’m here to tell you that you can. Each of these sites started out ‘blank’ at one point too. If hoping to earn money online with affiliate marketing, it’s just a matter of getting started and following quality training (as we share above). Wow, what a long read! This was very informative I’ve got to admit. I wish I had landed on this article of yours when I first joined WA. I wish I stepped into this with more research on affiliate marketing. The day I decided to join WA to see what this is all about, I had literally 1% knowledge probably? I just knew that I earn commission off affiliate marketing but just HOW? I was completely clueless. Thanks to everyone at WA, they are super helpful and have answered questions along the way through my training. I haven’t got to the stage of making any money yet but I do believe affiliate marketing works. All it takes like you said is time and the amount of work we put into our website. The more I read your article, the more it makes me feel I can leave my 9-5 job some time down the road (hopefully in the near future) and go full time with affiliate marketing. That would mean, more than 1 website of course but I know it’s possible. I came in with lots of doubts and I think those doubts still creep in from time to time. I’ve watched my traffic grow and I’ve also watched it drop even before I’ve put up any affiliate links… so it makes me quite nervous. Hopefully all the training that’s provided and all the help I’m getting from my friends at WA will be a part of my growth and success! Earning extra side money or even replacing my 9-5 job would benefit me in so many ways. Not only will I have the money to travel and work on my own schedule, I can also financially help my family and of course, take them on vacationSSS! These feelings of doubt and nervousness are quite normal and I can relate, even to this day. If your goal is to replace your income with affiliate marketing alone, I can assure you this can be done with hard work. If you can make $100 per month with an affiliate website, you can make $1000 per month, and so on. This advice was given to me a couple years back and as hard as it was believing it would actually happen for me, it did. Using the tools and training at Wealthy Affiliate. And all it takes is one website, having several is completely optional. In fact, for most people it is best to focus on just one website at a time. What a great definition you bring about affiliate marketing. I like that I can refer people somewhere without having to worry about handling any of the back-end stuff such as returns or any issues that come up with the product. I agree with you about tending to your business with dedication at least 10 if not more hours per week. I feel to stay on top of affiliate marketing you always have to come up with new ways to market yourself as well create new and exciting content every single day. Sure thing, Jag. You’re welcome! I think it’s incredibly valuable for newcomers wanting to learn how to make money online to have a business model like affiliate marketing. Because as you say, you don’t have to worry about handling any of the back-end duties such as shipping, returns, payment processing, etc. It’s all done for you by the company you choose to work with as an affiliate. This allows you more time to focus on your website and delivering quality content to visitors. Not to mention, there is no need to figure out how to create, manufacture, market, and sell your own product, from scratch. You can share helpful products that are already in existence and make money in the process. It’s a great way for anyone to make money on the internet, really. Great article and a very detailed post on affiliate marketing as well as all the pro and cons. You are right when you say it takes time to make money as I think I took over a year before I made my first sale. Luckily I enjoyed the journey so I stayed pretty motivated. If you choose to start an affiliate marketing businees, I highly suggest that you blog about a topic you are highly interested in sharing with others and then when the money starts coming in you will just think of it as a bonus. Great advice Michel, and that first sale as an affiliate is the sweetest. It’s usually a sign that you are doing something right. If you can make one sale, you can make 100 sales, and so on. Thanks for reading through our affiliate marketing guide. This is a really well written guide. I just wanted to comment because I happened to find W.A. myself a while back, and this article explains it in a ‘real-life’ sense. You give W.A. an honest review here, and share some great information for those looking for a REAL path to building a sustainable long-term online home business. W.A.’s training is second to none. What really impressed me in the beginning is the free starter membership, and the fact that you are immediately immersed in something tangible and productive. I’m really glad to have found W.A., and wish I had found them earlier. Hopefully your article will help others find them, and lead them to build their new business and lifestyle as well! Hey Cris, glad to hear that you are a part of WA as well. Here’s my profile within the community if you care to add me, lol. The membership has everything you need to get started and to run an online business for years to come. And yes, if it wasn’t for the free Starter membership, I would have never joined because I did not have ANY extra money at that time. I eventually saw it as a good investment and decided to upgrade later, which has paid for itself many times over. Glad to hear that you too are enjoying the training and community there. I’m so glad i found this post. Before this was checking out a lot of other ones about affiliate marketing guides and none of them really added much value. This post truly is a one stop shop. You break down how it works, real life examples and then you provide a place to get started. Will definitely be checking out Wealthy Affiliate. Do you have another post about tips on getting started on Wealthy Affiliate? Hi Barry, I sure do. You can learn more about Wealthy Affiliate on this page. I’ve just started out with Affiliate Marketing and your article is fantastic! It has covered a lot of information for me and is realistic in outlining that it can take time before seeing revenue. Thank you for your detailed report. I’ve joined Wealthy Affiliate, and I’m finding it to be a great resource with helping me start my business.